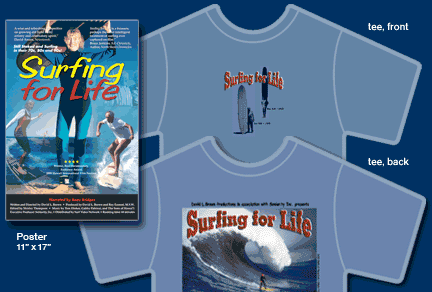 Order SURFING FOR LIFE DVDs, posters and t-shirts! Special Features include "Making of," Photo Gallery, Bios and Media Coverage. Institutional price for libraries, schools, colleges and universities. Sales price includes shipping (by priority mail) and handling. Allow ten days. A maximum of two t-shirts can be ordered at a time. Additional t-shirts require another order. Paying by check? Click here for our printable order form.